As promised here is my post about the things that matter most. Lucky for me; I spent the past several days in the land of no cell phone, internet, or any other technology. This gave me the clarity I needed to work this post out. If you read this blog at all you must already realize that my kiddos are certainly one of THE most important things to me but it goes beyond that. Family, the unit, the togetherness, the suffering at times, the love and respect, and the eternal aspect of it all. These are the things that matter the very most to me. I know my family loves me and they know that I love them. We stick together through all sorts of joy and pain and sorrow. We must; we know the ultimate reward for doing so and we all want to achieve that greatness. 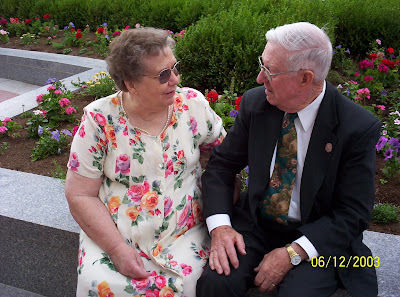 But Grandpa and Grandma (on both sides) have been great examples to me of how to keep a family together. Thanks to my mom and dad for being great examples and supporting us through all we have been through! Now your turn. Tell me what matters most to you or how your family is a great example for you. CLICK HERE, to go to my forum and discuss it there. Share the link on your blog or twitter or facebook. Sad that we missed the Blood Drive!! Lovin the pic of Jeff in the hat- he's rockin it!! I agree, family is so important. Your grandparents look like great people. Family reunions are the BEST! This is my first visit to your blog. I love your scrapbooking pages. Wish I was more of a scrapbooker. I think if I had your creative skills, I would be one. Very fun pages.